On the evening of 8th June, Raccortubi was awarded the 2016 Business International Finance Award for its Administrative Processes, Accounting and Management Systems. 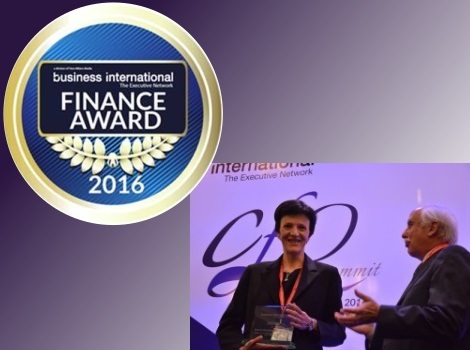 The Business International Awards Ceremony took place at the Melià hotel in Milan, during the two-day 2016 CFO summit. The aim of the event was to reward the most innovative entrepreneurial companies that have carried out new business projects and strategies in the fields of Administration, Finance and Control, Corporate Governance, and Risk Management. Important organisations recognised alongside Raccortubi included Safilo, Assicurazioni Generali and Mediaset, amongst others. Over the course of the past year, Raccortubi has implemented a series of new processes to enhance automation, efficiency, compliance, and therefore optimisation, in the management of its administrative and accounting systems. Tiziana Bonacina, Raccortubi Group Chief Financial Officer who joined the company in June last year, was present at the ceremony to collect the award on behalf of Raccortubi.